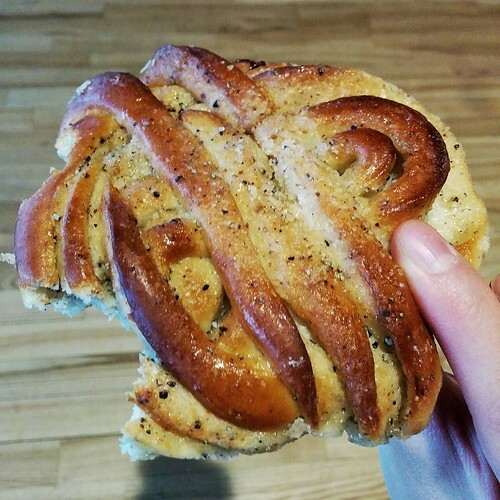 For my last post on Stockholm, I’d like to focus on what I always associate with Sweden – baked goods, excellent baked goods. These excellent baked goods made up my breakfasts and my fikas and were eaten on the hoof, in cafes, at tourist attractions. 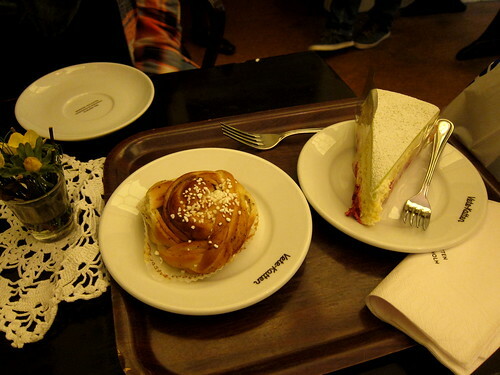 My first fika was at Vete-Katten, a well-preserved labyrinth of a coffee shop in the centre of Stockholm. 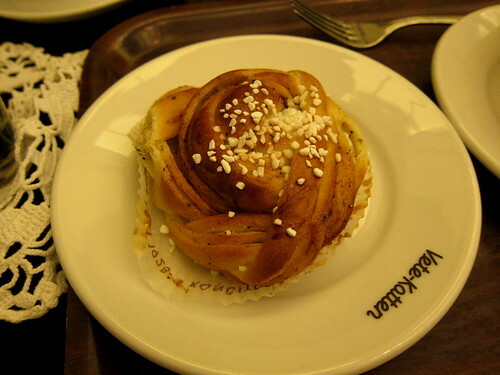 There was, of course, coffee (apparently Swedes have the 2nd or 3rd highest coffee consumption per capita) and an excellent kardemummabulle (cardamom bun). And their Prinsesstarta! I never really understood this cake, thinking the green layer on top was all a bit odd but my goodness was it ever good. 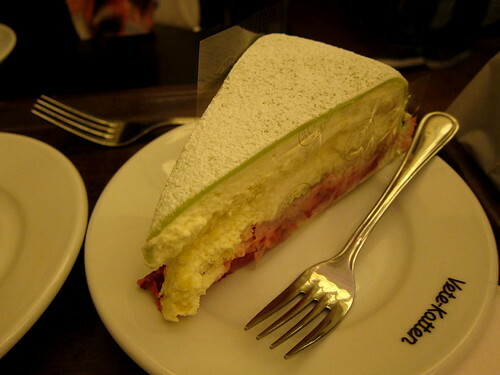 The lovely thin layer of green marzipan held together the lightest freshest whipped cream and a most delicate sponge. It’s a popular cafe and you may struggle to find a seat on the weekend but it’s worth the wait! Later in the week, I visited another well-known cafe located down the road – Sturekatten (what’s with the cat names?). The cafe is quite a well known one locally with its original vintage furniture and tasty food. 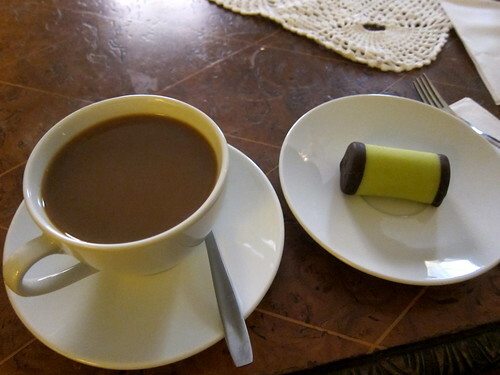 I settled in with some coffee and a punschrulle (aka the dammsugare, or vacuum cleaner). Both very good though most of the baked goods did look a little better at Vete-Katten. And then there were the rest of the bakeries I frequented every morning before work each day for the remainder of the week. I was based that time very close to central Stockholm and I’d grab something from a different place each day. 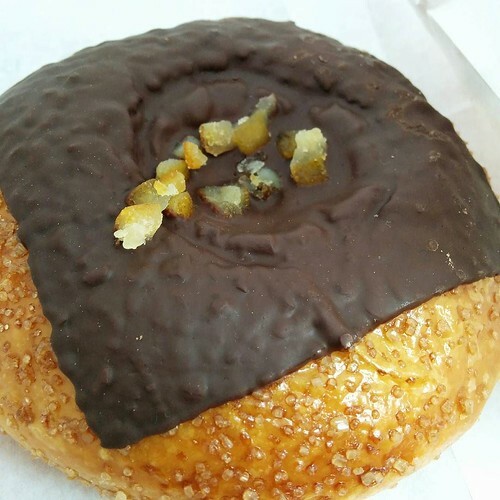 From a chain called Gateau, I tried an orange brioche filled with vanilla cream and then topped with chocolate. Not outstanding but very good. Perhaps it was a bit too much cream for me for breakfast time. 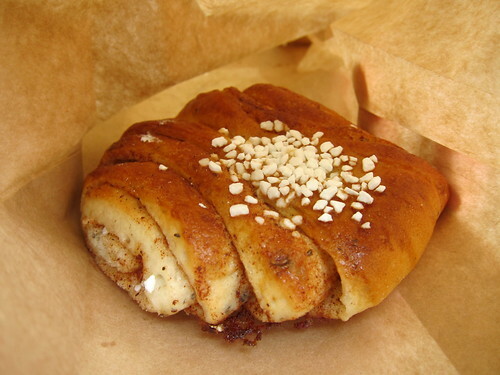 … and an excellent kardemummabulle (shh, I prefer cardamom buns to cinnamon buns). 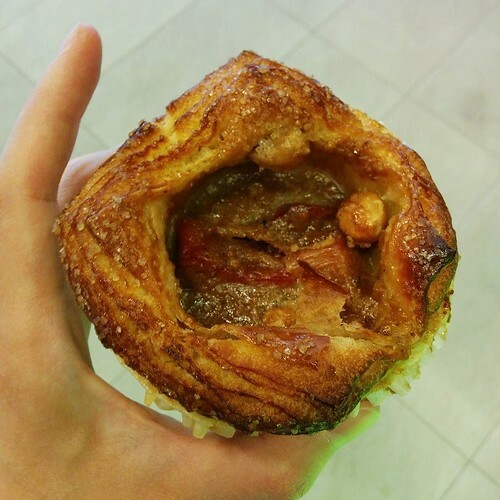 And I discovered the mandelbulle (almond bun) sold at Bröd & Salt, another bakery chain found throughout Stockholm. Imagine that cardamom dough rolled up with frangipane, sliced and then topped with a biscuit topping with lots of whole almonds. Yes, it was amazing. 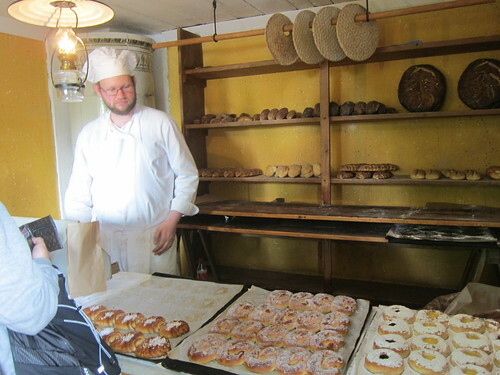 There were even visits to two bakeries in Skansen! 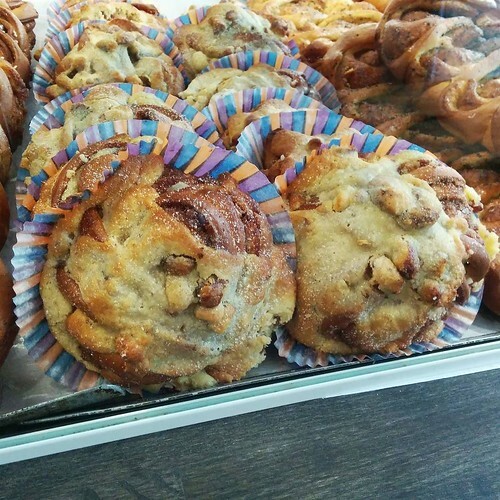 There was first the village bakery that actually does sell its wares still to the public. I purchased a delightfully homemade looking kanelbulle (cinnamon bun) and munched that happily as I continued with my visit. 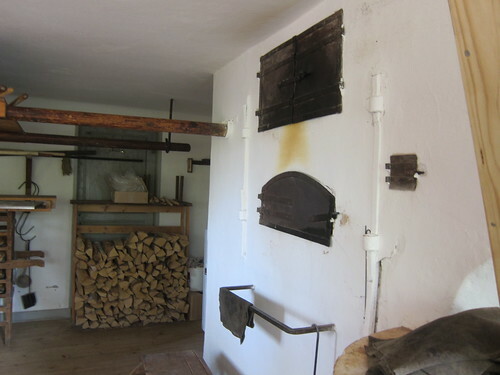 Then there was my favourite – the bakehouse. 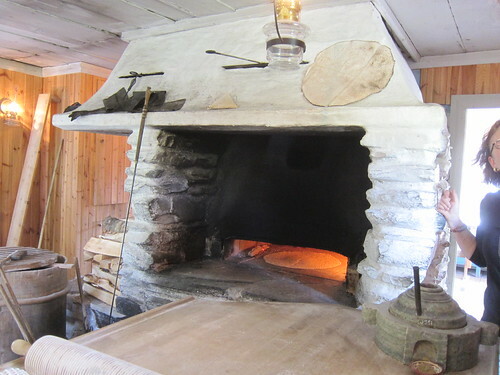 Here is where the famous Swedish flatbreads are baked for keeping throughout the year and being baked that day was tunnbröd (thin bread). Apparently the traditional version would be baked very dry and the soft versions available at supermarkets (and frozen at Ikea) are fancy modern thin breads. 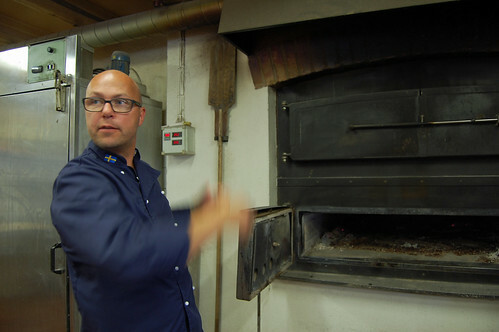 … and then baked in the wood-fired oven. And when it came out, there was butter to slather onto the hot bread… it was excellent! I loved Stockholm! I loved its food and its beautiful surroundings and its flowers and everything. I’m hoping to visit again in the future, bringing Blai with me this time, and he’s keen to go too after seeing all my photos. Thanks to everyone who sent information about Stockholm, its restaurants, and Eurovision, which was on the weekend I was there! As is usual, all my Stockholm travel photos are sitting in a dedicated Flickr album. I was in Stockholm for work and that let me try some of the weekday lunch deals on offer at various outlets. At Café Panorama, a few daily dishes are on offer. 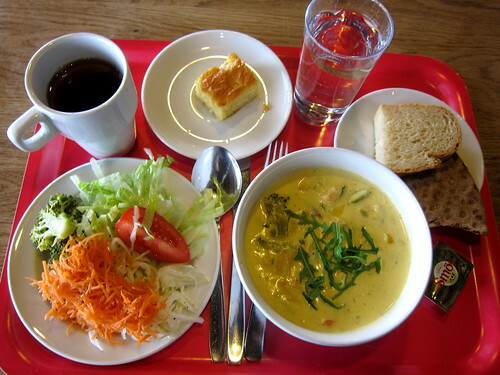 For 95 kr, you chose your main course (this appears to change each day) – fish soup for me – and it included access to the drinks dispenser, a salad bar with bread and cake, and coffee or tea to finish. 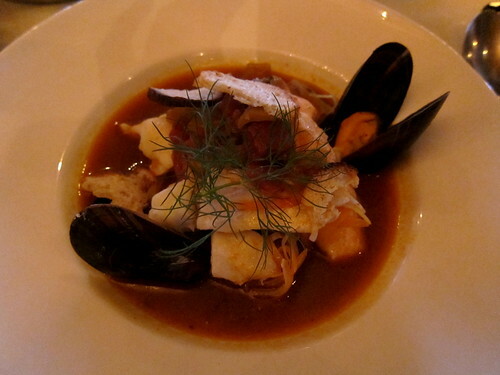 That fish soup was a cream based one that was chock-full of fish and shrimp – it was a fish stew rather than soup. It really felt like a bargain with all that fish in there – really, did I mention it was jam packed full of fish? And it was all delicious. I visited Hötorgshallen market hall two days in a row, keen to try a couple of the vendors. I went with Saluplats Husman and their adorable fur covered stools. 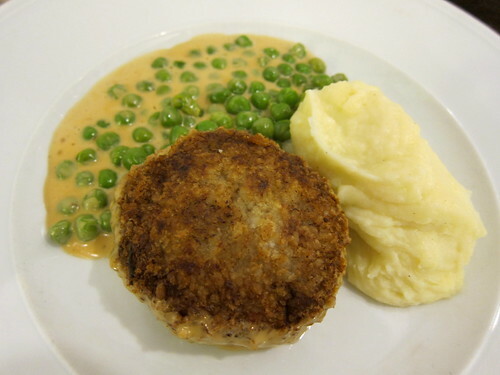 For about 100 kr, I got a lunch of wallenbergere with mashed potatoes, peas, gravy and all the lingonberries I could eat. 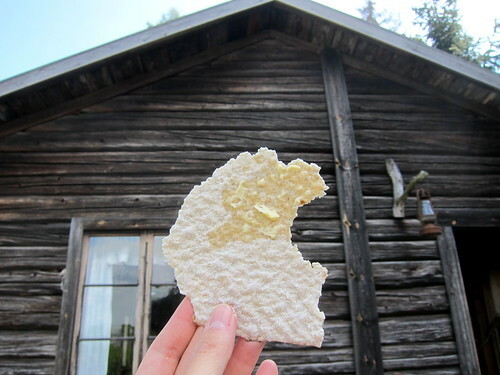 There was bread and knäckebröd on the side and also water or lingonberry water to drink. And that veal burger was delicious, with a richness that’s due to the addition of eggs and cream. I almost forgot, there was coffee included, of course! 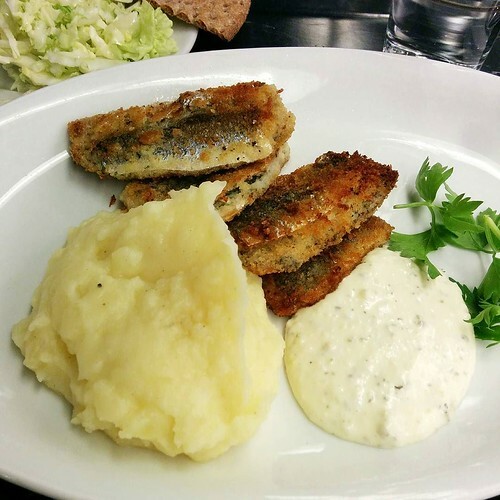 On the second day, we joined the queue at Kajsas Fisk where I perused the fishy menu for what seems like ages before finally deciding on the fried herring with fresh mashed potatoes and remoulade sauce (100 kr). 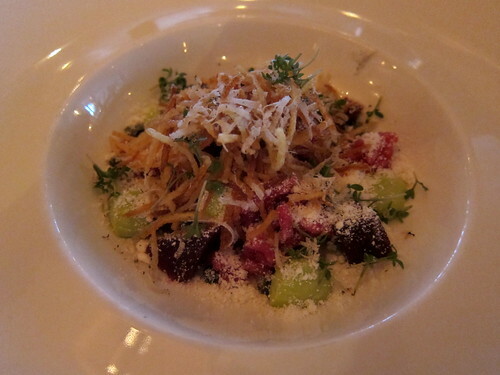 There it was again, my new favourite Swedish fish dish and this time was just as delicious. Remoulade sauce was a great creamy, tangy addition. Of course, bread and salad were included though I couldn’t check on the coffee as I had to rush back to work. I should confirm that lunches on weekends are good too! 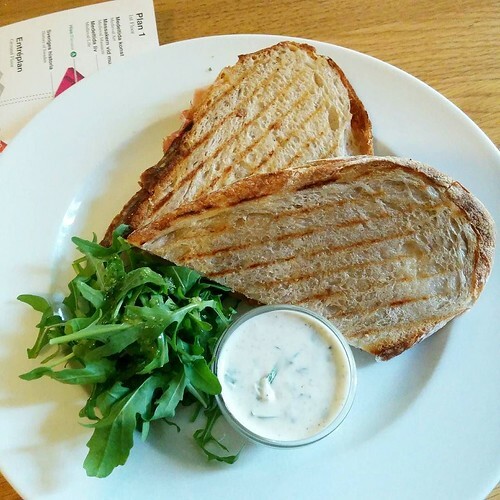 I was in the Historiska Museet (the Swedish History Museum) on a Sunday and there was a good selection of hot and cold foods – it was a toasted ham, cheese and tomato for me, and with a little salad, it hit the spot! And they too have lunch specials on weekdays. 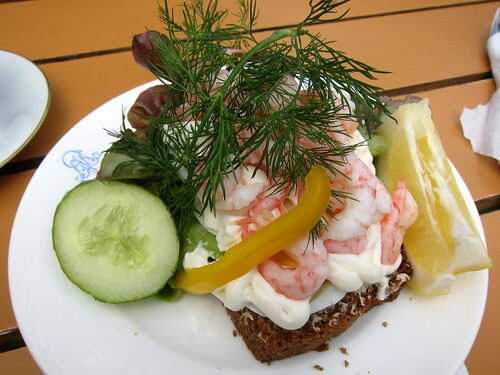 And this was my excellent prawn sandwich (about 100 kr) on my last day in Stockholm at Café Petissan in Skansen. 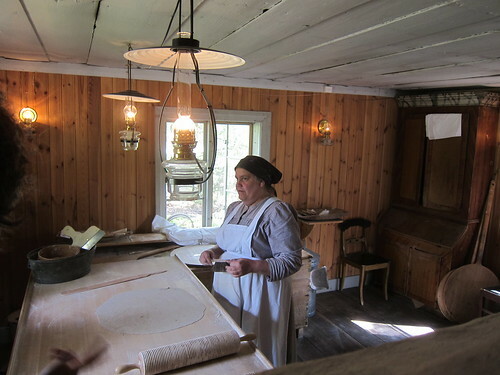 As an aside, Skansen is an absolutely brilliant open-air museum (the world’s first) which I highly recommend – I thought it was mainly a children’s museum at first but that’s far from the truth. 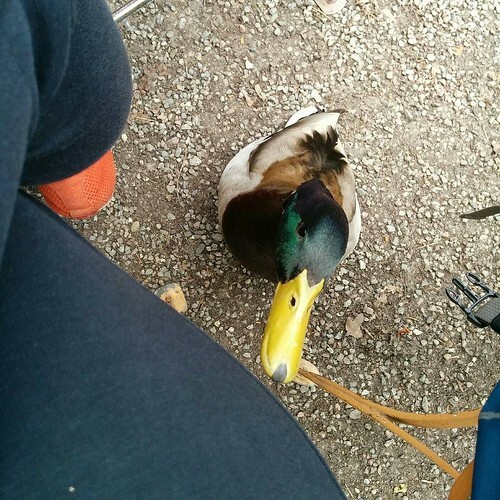 I had a lunch companion too – this duck – and he showed up by my side begging for a little treat, even going so far as to nudge me gently in the thigh. He got a little seedy bread for his troubles. I cannot promise that you too will have a ducky friend but it certainly made for a memorable lunch! The weather that evening was vile – all stormy and windy and with a windchill below zero – and I didn’t want to venture far from my hotel. I was staying in the Scandic Alvik and while there’s a good supermarket and good cafes nearby, there are few restaurants in the area. It’s in a good spot though as the train gets you into central Stockholm quickly but that night really was something; I needed somewhere to eat close by. 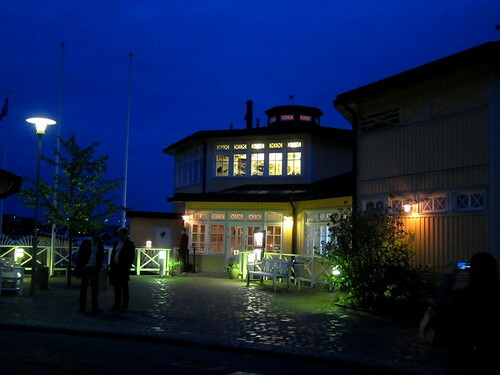 I did note a cute restaurant at the end of the street by the water on Google maps and heck, that restaurant – Sjöpaviljongen – turned out to not just be by the water but on the water. 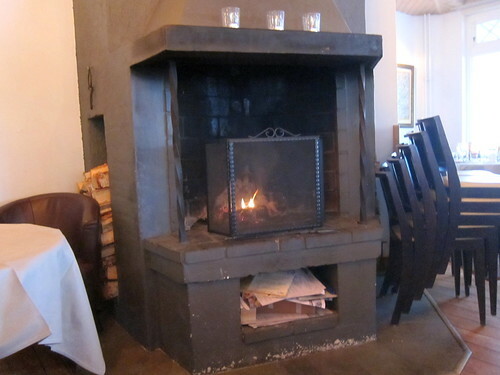 They found a table for me right by the open fire (I must have looked like a drenched rat) and I am forever grateful to them for it. Service was exceptional that evening and I was made to feel most welcome. The selection of bread that was brought over was divine. 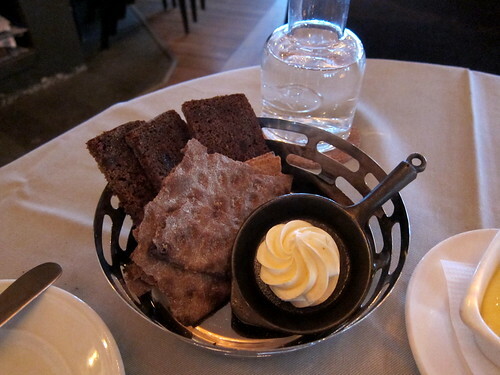 My favourite was a sweet-ish dark bread that was utterly divine with lashings of the accompanying whipped butter. I could have eaten the whole lot if I didn’t have lots to look forward to. My first course of Råbiff på svenskt gårdskött, ramslökskräm, betor, kapris och sommartryffel (Steak tartar on Swedish meat, ramsons, beetroots, capers and summer truffle, 165 SEK) was beautiful, all delicate little things tossed together with contrasts in every bite. Slivers of fried potato gave the whole mixture a lovely little crunch. I was extremely happy with my Sjöpaviljongens fisk- och skaldjursgryta med aioli (Fish- and shellfish casserole with aioli, 199 SEK) – again another little break from cream. There was salmon, cod, another white fish I couldn’t identify, shrimps, crayfish, and mussels all mixed up in this tomato based broth with fennel, onions and dill. A little slurp of soup, a little dollop of aioli on my fish….mmm… I’m salivating just thinking about this. It was lovely and cosy in there and I wished I didn’t need to head back to hotel! 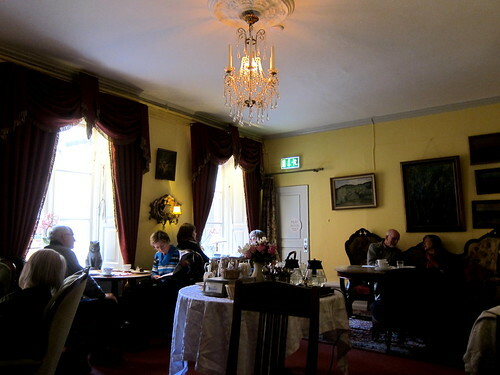 The photo below shows you the inside and its coziness reminded me of many of the traditional Swedish restaurants I visited when I visited West Sweden a few years back. I loved the place so much I returned later that week for another dinner, this time with colleagues. And this time the weather was gorgeous (such a change less than a week later!) and we had drinks prior to the meal on the deck on the water. 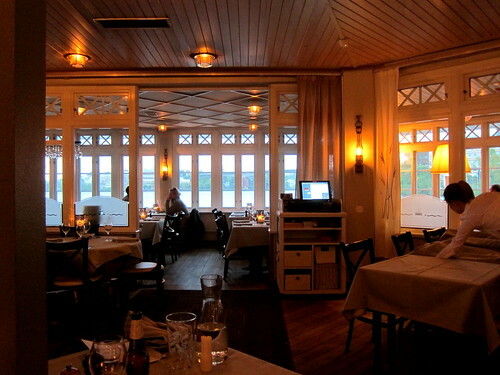 We could look out upon the calm waters across to Kristineberg (another Stockholm district). 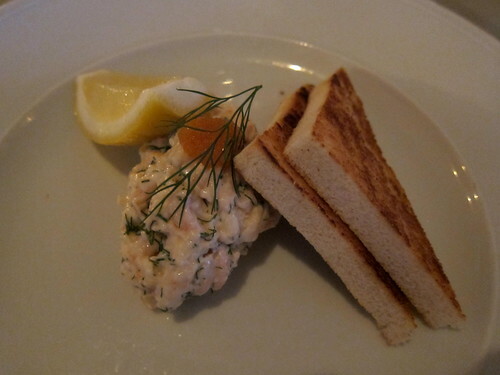 This time I started with Toast Skagen med kalixlöjrom (Toast with a mix of prawns, dill and mayonnaise and a fish roe topping, 129 SEK), quite a common classic Swedish starter. I was really looking forward to my main course of Biff Rydberg med rå äggula och senapsgrädde (Biff Rydberg with egg yolk and creamy mustard, 259 SEK); I was thinking about it all day since we had to choose our dishes in advance for such a large group. This was fabulous – a kind of luxurious version of the classic Swedish pyttipanna, which is a hash of potatoes, onions, and meat. And here there was fried potatoes, fried onions, fried pieces of fillet steak and a raw egg to hold it all together. Oh, and a butter sauce. Delicious. A final photo of the restaurant! If you go, do make a booking if you can – the best way to contact them is via their email address on their website. Apparently Friday nights are taco nights in Sweden. There’s some understanding (thanks to a clearly ridiculously successful marketing campaign) that Friday nights are for cosy nights in with tacos (or pizza) and junk food; there’s even a word for it – Fredagsmys (cosy Friday). 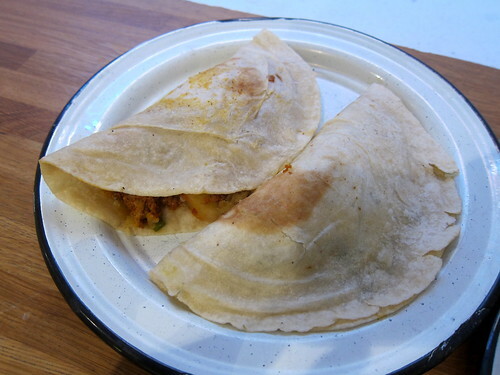 Swedish tacos are … very different from Mexican tacos and perhaps are more similar to those eaten of the Old El Paso kit variety here in the UK. Actually there are some clear differences from these as well as this hilarious Reddit post illustrates. Anyway, I thought of this tradition as I munched away on some excellent Mexican food in Sweden. 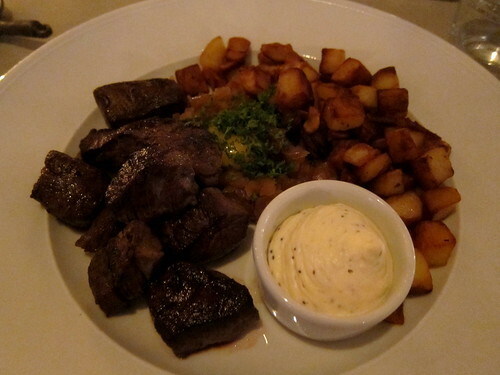 We’ll rewind to half an hour prior to proper tacos – after a few days of butter and cream, I couldn’t face another very rich cream-laden Swedish meal. 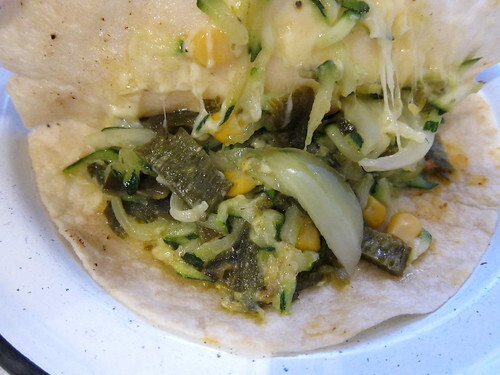 I contemplated the highly rated vegan Chinese place near my Airbnb flat but when I saw the reviews for La Neta, a Mexican joint just a little further walk away, tacos tacos tacos consumed my mind. 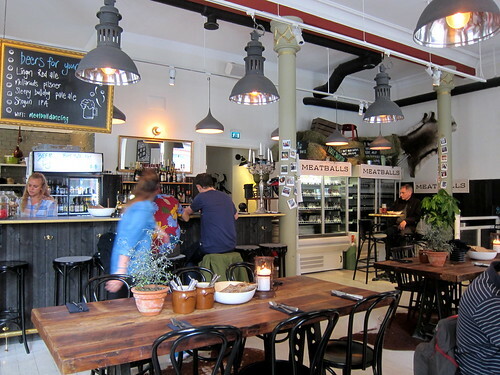 The restaurant on Barnhusgatan is tiny – it’s a basement joint with a large kitchen (I believe they make their tortillas on site) and shared dining tables and a counter by the window. Queue at the till, place your order, find a seat, and pick up your order when your buzzer goes. I had one each of the tacos on offer that day: Tacos de Pastor (marinated pork with pineapple), Suadero (a slow cooked beef), Bistec (grilled steak). They were 22 kr each and were served on homemade corn tortillas. Of course, tacos are not complete without a salsa bar – and I’m glad to report that La Neta had a little one! I added the chopped onions and coriander and helped myself to the green and red salsas on offer. From what I can see on Instagram, their salsas are made fresh each day. They were perfect – the tacos and the salsas. 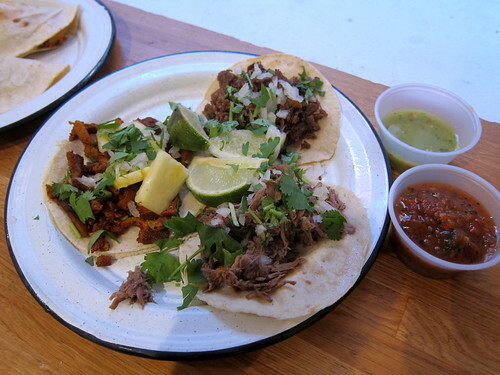 The meats were all tender and flavourful and tacos just looked right. 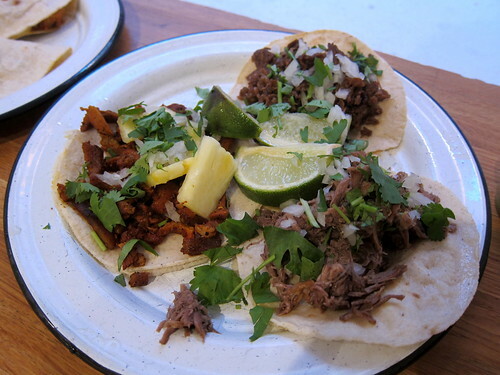 An aside: I read recently that La Neta was opened by two natives of Monterey, California, both of whom missed the Mexican food they could get easily back home – these were legit tacos. 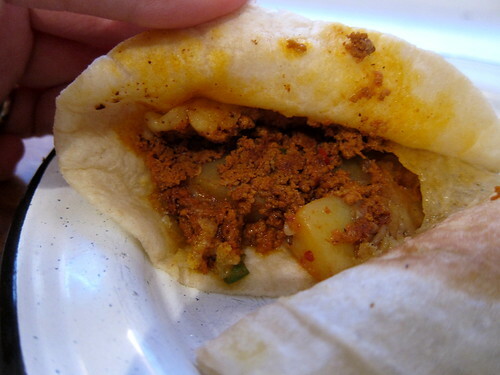 … and a Choripapa (potato, chili, onion and chorizo – 28 kr). Both were excellent and of note was the Mexican chorizo which was totally on point. My Mexican dinner hit the spot – and fret not, I went straight back to trying more Swedish foods after my palate was refreshed here. There are freshly made tortilla chips and larger tacos in flour tortillas too. And you can even buy their freshly made corn tortillas by the kilo. I love this place! There’s a second branch on Södermalm. Head south from Gamla Stan in Stockholm and you’ll pass the metro station Slussen. 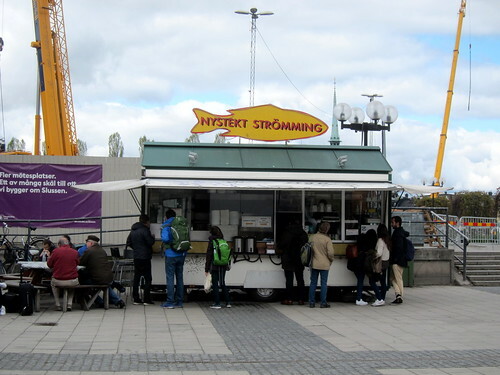 In front of the station is a large square that will be filled with the usual fruit stands and flower stands; somewhere towards the back will be this van, with its large fish sign emblazoned with ‘Nystekt Strömming’. The name of the van translates to ‘Freshly Fried Herring’ and yup, that’s all they do here. There are options to have your fried herring in a burger bun, or on some brown bread as an open faced sandwich, or as a ‘meal’, which is the option I chose. 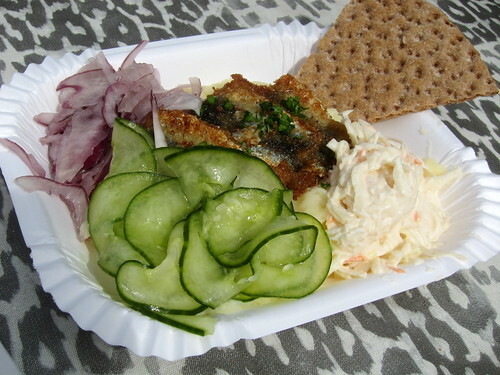 This was my small fried herring plate that came with mashed potatoes, pickled cucumber, sliced onions, coleslaw, and a piece of knäckebröd. I think this was about 60 kr (SEK). There are a few tables on which to park yourself though if the weather is nice, there’s plenty of ledges on which to sit around the area. I do believe fried herring is now my favourite herring preparation – I love the flavour of the oily fish when cooked like this! The fish was fresh and tender and not at all fishy and the salads help cut through any richness you may find. I wish I’d had more opportunity to try the rest of the menu; the burger looked great as did the open sandwich. Or if you don’t find yourself in the area, you can find fried herring at some traditional Swedish restaurants too (more on that later). It’s not for late night eats (I believe it closes at 6pm on most days) but an order from there makes for a perfect snack or light lunch. The first thing that comes to mind when Sweden is brought up is probably meatballs. Or Ikea. Or Ikea meatballs. Of course, on a week-long trip to Stockholm (for business and leisure), there’d be plenty of time to try the real thing. I had my first meatballs on this trip at Meatballs for the People, a meatball-loving pub/restaurant located in the trendy area of SoFo (south of Folkungagatan) in Södermalm. I visited for lunch and there was a short menu of traditional Swedish meatballs, a Caesar salad with rooster meatballs, and an open-faced meatball sandwich. One of the first for me please! This was also my first experience with the lunch deals in Stockholm. I placed my order for my meatballs and the total price with a drink came to about 130 SEK. I waited for my lunch, there were little stations around to help yourself to homemade pickles, bread (and knäckebröd) and butter, and after your meal, biscuits with coffee. Lovely! 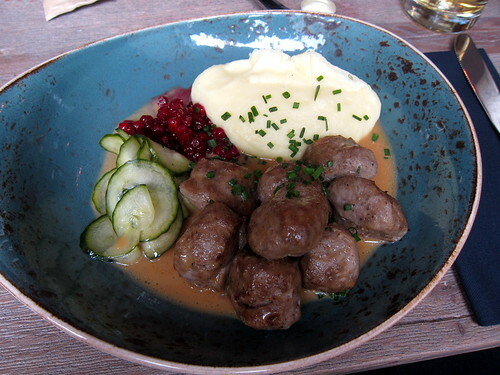 My bowl of beautifully tender meatballs came with a little hill of mashed potatoes, lingonberries, pickled cucumber slices, and plenty of the usual cream gravy. I loved the lingonberries, clearly just fresh berries cooked gently with a little sugar; they made for a sweet-tart pop beside the creamy gravy and potatoes. Highly recommended! They also sell their meatballs (quite a few varieties from what I could see that day) to have at home. On our final day in Skane, we left Malmo and took a train to the town of Ystad, famous for being home to the fictional detective Kurt Wallander. You’ll all be glad to hear that Ystad looks like quite a pretty peaceful town whose police-people are more likely to be posing with tourists than dealing with terrible murders! At Ystad station, we met Karin again and she drove us out to Österlenkryddor, a herb farm about a 10 minute drive outside Ystad. 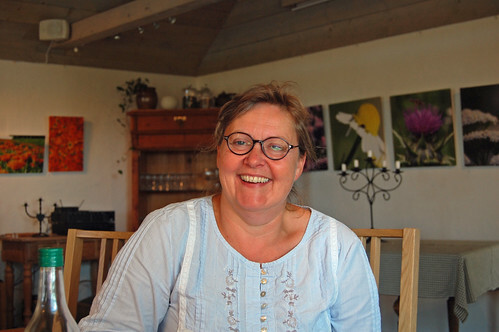 It’s a family business run by Eva and Olle Olsson and they run the largest herb farm in Sweden. Eva had set out fika for us that morning, with each homemade component featuring their herbs. 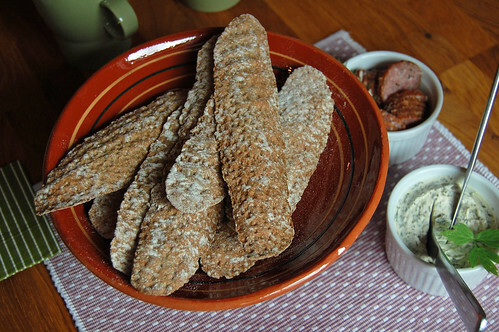 The rye crispbreads had been baked with stinging nettle. Soft cheese had been mixed with lovage, a savoury herb high in glutamates (Eva suggested boiling potatoes with lovage). Their delicious smoked sausage had a mixture of rosemary and savory in its filling. 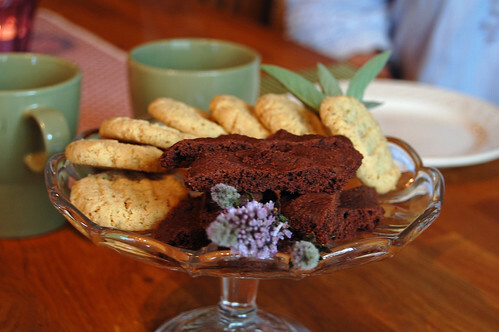 It wasn’t all savoury though – Eva had baked oat biscuits with sage and chocolate biscuits with mint too. And with it all was a fantastic infusion of lemon balm, mint and sage – I made sure to buy a bag of this from their shop before I left and am enjoying it now as I type this post! Lots of herbs you know and probably some you don’t are grown here. Eva told us of their trouble growing rosemary (usually a perennial here but it’s had to be an annual there in Sweden) and their recent midnight harvest party for wordwood. 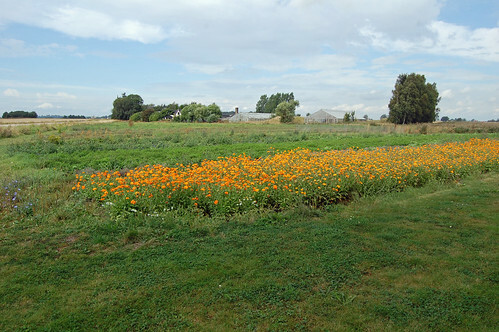 While we didn’t have time to tour their herb fields, we could get a glimpse of them from their herb garden (first photo), where we got a short explanation of some of their more exciting herbs (yes, they had a poisonous plants section…). Their shop sells all their dried herbs, herb mixtures and herb products and on weekends, you can fika here at their cafe too. It’s a very calming and relaxing place and their products are delicious. 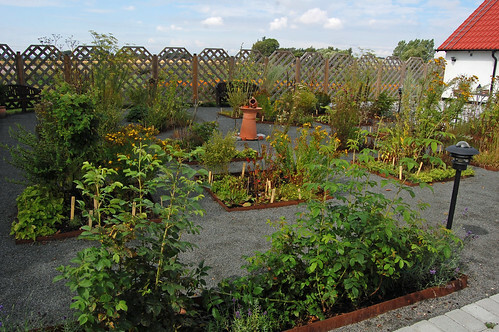 Tours of their herb fields can also be arranged and do take a look at their website for this and other events. 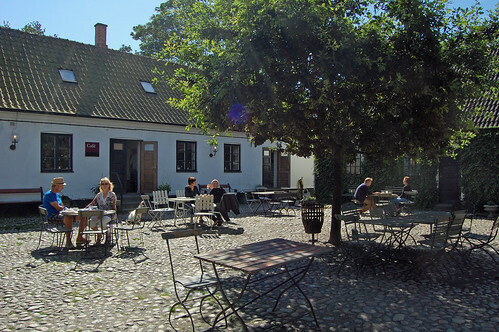 Apart from their shop and online, you can also find their goods at the Malmo farmers market. 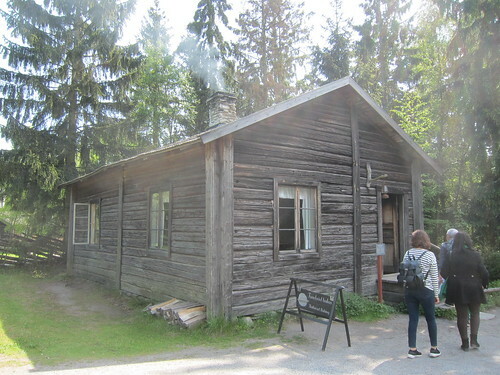 Our lunch destination that day was Olof Viktors and I was very much looking forward to this visit as every Swedish person to whom I had mentioned the name became very excited themselves. 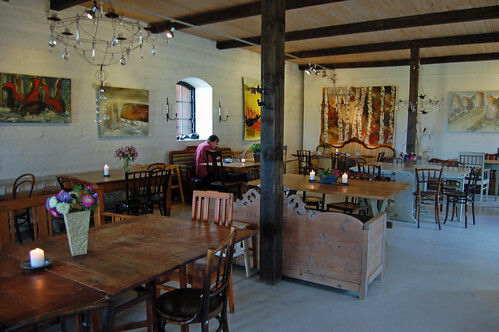 It was a short drive from Österlenkryddor and when we arrived, we were led to a table set for us. See that table in the back of the room? With the sofa? We sat there and we learned, thrilled, that the sofa we sat on had featured in one of the Wallander series in a scene with a grisly murder. 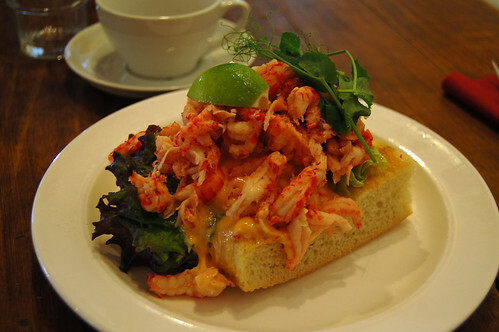 They had arranged for all of us to try their most famous sandwich – an open faced crayfish sandwich. This was piled very high on a very non-Swedish bread, focaccia! It was delicious and very generously portioned! Dessert was a selection of their famous ice creams. 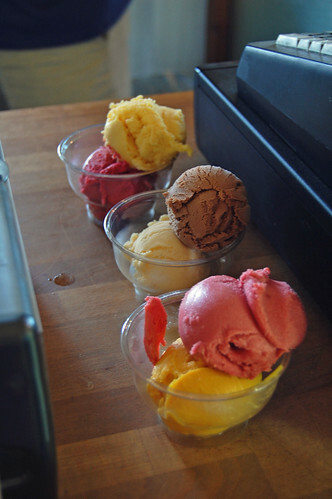 Chocolate, vanilla, strawberry and yoghurt, mango and yoghurt, passionfruit sorbet and raspberry sorbet were scooped for us. They were all truly excellent but special mention must go to the ice creams made with yoghurt – it gave a bit of tang to the mango which helped prevent it from being too sweet. …and the rest of the cafe (there were more buildings than I expected!) too. The cafe really was as beautiful as everyone had told me it would be! Mårten Göthberg the managing director then kindly sent us off with some of their famous knäckebröd. We ended with a whistle-stop car tour of Ystad (I’d love to spend more time there in the future) and then a drive back to Malmo Airport to catch our flights back to London. Thank you so much to everyone we met on this trip and thank you very much to Malmö Turism, Skåne Tourism and Visit Sweden for a lovely food-packed weekend in Skane. As always, all my photos from this trip are in a Flickr photoset.